Blockchain, the technology behind Bitcoin and other cryptocurrencies, will change not only how we pay for but also how we play games. To better understand why, we need to look at the state of games today. Last November, Capcom released Puzzle Fighter Mobile: the social, mobile, free-to-play version of Street Fighter. People were vocal about its pay-to-win structure, and how it was too different from its skill-based predecessor. For such a strong and storied license, the game has been unable to break the Top 100 in the app store charts. Players have become disillusioned with the Free to Play model. While it was responsible for reducing piracy and growing the audience of players, it also has a dark side — manifesting in greedy and opaque monetization systems. Free to Play monetization strategies have also started appearing in paid games. Around the same time last year, gamers were up in arms over Star Wars Battlefront 2’s loot box system. A player computed that it took 40 hours to be able to unlock Darth Vader and play as him, even in a game where people already paid more than $60 just to play the game. The resulting backlash was strong — EA’s response to the controversy became the most downvoted reddit comment in history and spawned multiple memes. Free to Play has replaced Pay to Play as the game industry’s dominant monetization model, but its scorched-earth approach didn’t just affect piracy. In the process we’ve also lost the simplicity and honesty of a direct Pay to Play transaction. We play games for free, but some of them lull us into a false sense of ‘free’. They quietly chip away at our compulsion, making it suddenly rear its head through mind hacks such as time sensitive events and perceived sale values. Some games turn us into walking advertisements — monetizing our data and our social connections, forcing us to send out invites to friends in return for a few virtual tokens. Still some others force us to pay with the most fundamental currency of all — our time. They build on our human desire to complete tasks and collections, and those who are unable to pay with tokens are forced to grind away their hours playing and watching ads until the game is more work than enjoyment. The games may be Free to Play, but in certain game ecosystems, it may actually be cheaper to pay than to play for free. This is the state of the industry now, given how competitive the market is. With so many games vying for attention, game developers have to compete using the tools they know are effective. The game industry is facing a growth wall though. Just this year Supercell’s revenues dipped 20%, and the number of Candy Crush users have started declining. We are at a mature cycle of the industry where there’s too much competition, not enough innovation and a looming saturation point for players. We may have to look past our current models and technologies, and find a way to break our reliance on Free to Play. Ironically, one of the means of doing so may be through the use of blockchains. Used by top games such as Clash Royale, Fire Emblem Heroes and Overwatch, it monetizes players by first showing them items they can buy either through banner ads prominently displayed in game menus or in normal gameplay used by other players. The games are designed to build up a player’s desire to buy the items until he gives in and pays for them. There are two issues with this: Firstly, a player is usually unable to buy something directly, and usually needs to spend more than what they want to pay to do so. Some games make the chance of getting the items so low and don’t publicize their loot box odds, so the player is stuck spending hundreds of dollars until he gets the item he wants. Secondly, after the player has spent a significant amount the item that he gets from the game is essentially worthless outside of the game. It’s locked in the game ecosystem, with no option for the player to take it out. This has been always the case with games, but players have always found ways to do so — usually by trading them through a third party exchange or even trading accounts in gray markets. There is clearly player demand for this though, but the prevailing idea is that it always has been beneficial to games and app store platforms to close down their ecosystems. Cryptoitem Gacha model: Player inserts tokens in an open, peer-reviewed smart contract for a provable chance to get an item. The item is stored on the blockchain, making it tradable like Bitcoin or Ethereum. If the user wants to get back tokens for the item, he can sell it to another player and get tokens back in return. The invention of blockchain allowed exactly that. By storing game items on blockchains instead of centralized servers, these new cryptoitems become liquid, able to easily flow across users. They act similarly to cryptocurrencies: given the right credentials, any player can just send a cryptoitem to another player, without having the need to go through a central authority like a bank or an app store. Since the blockchain was designed to be transparent, it also eliminates the opaqueness of loot box percentages. Transactions and source code written on the blockchain are open and verifiable, making it easy for players to verify if the developer is providing fair odds. There were pioneers such as EverdreamSoft’s Spells of Genesis that saw the potential of cryptoitems early on. Now, with the rising awareness of cryptocurrencies along with the innovations brought about by new blockchains, a new genre of cryptogames like Cryptokitties are starting to break into the mainstream. This is just the early days of cryptoitems though. The technology and standards around crypoitems are still improving, and once it reaches a tipping point they will revolutionize both how we we pay and play for games. The current free-to-play model. Value usually goes through the gatekeepers first such as ad providers, social networks and app stores before reaching the player or developer. We see it happening now. With Free to Play at its maturity, the economy has started to centralize around main entities: the app stores and the ad/social networks. They serve as gatekeepers, making it necessary for a player to go through them before having a direct economic connection with the player. By using the blockchain, Cryptogame developers have been able to upend this model. One model we see emerging is the Item First Economy. 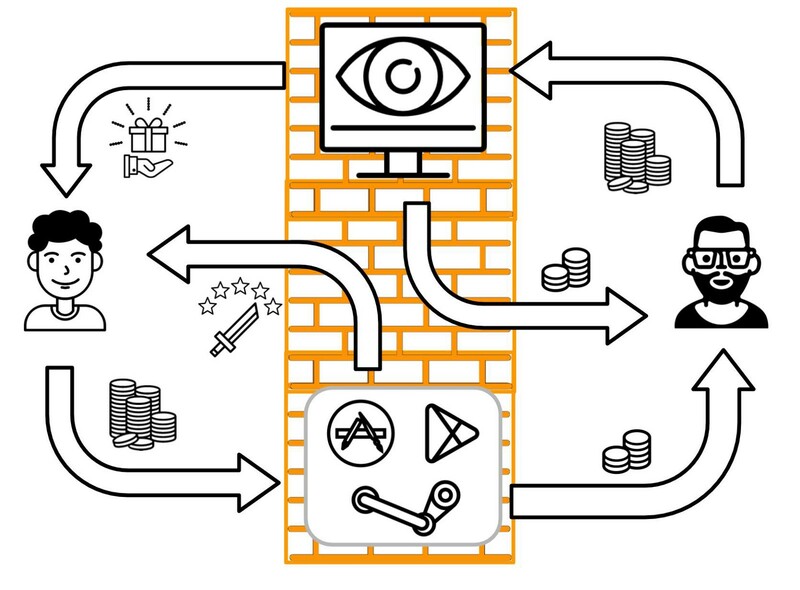 This is similar to a crowdfunding and early access campaign: the developer creates cryptoitems first, which players can purchase directly from the developer using tokens. The developer then uses the tokens generated by the item sale to fund the creation of the game world. As game development progresses, the player can use the items he bought as the entry point to play the game. Most cryptogames like Etherbots and Ethercraft follow this model. This new model has introduced some interesting dynamics. Aside from making the game fun to play, the developer also needs to be able to prove the value of his cryptoitems — either by increasing their collectability or increasing their utility in the game. Since cryptoitems are easily tradable, the player needs to see their value or else they will just sell them and play a different game. The focus has changed from extracting payment for playing to building sustainable game economies. Imagine years in the future — cryptoitems are already a standard in games, the same way that a 3D file is a standard. There are also cryptoitem specs for item types, like swords and hats. Airship Syndicate announces their latest game, Battlechasers 2. To support the game, they also start an auction of the limited edition ‘Artifact Blade’ cryptoitem. It is beautifully modeled in 3D by the game’s 3d artists, hosted on decentralized servers and viewable through any cryptoitem web viewer. Most of all, it follows the cryptoitem sword spec. Warframe started supporting the cryptoitem sword spec months before, making all the swords in their game cryptoitems. This opened up their economy, creating a vibrant marketplace of weapons trading hands among players and collectors. This also enabled new ways to get weapons into the game. By following the cryptoitem sword spec, any player who bought a cryptoitem sword like the Artifact Blade can also immediately use them in Warframe. Warframe is not the only game that supports the spec: Blade Symphony and Raw Data do as well. Suddenly the cryptoitem we bought for an in-development game is usable across three different games. Different games and universes, yet all having a shared cryptoitem economy. It’s a scene straight out of Ready Player One. 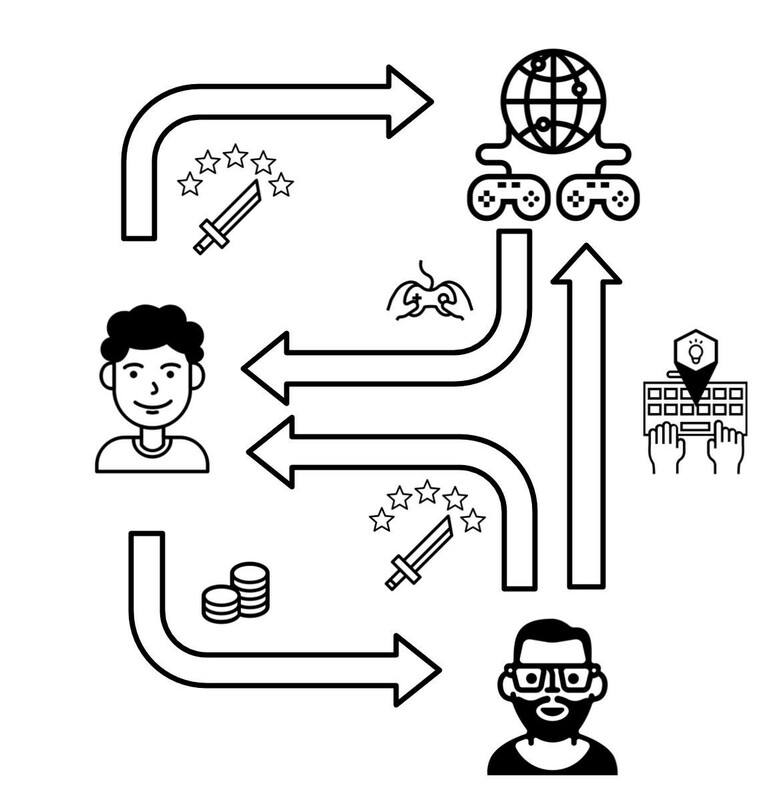 This is Alto’s vision for a blockchain connected game industry. Players have a direct economic connection to developers via the cryptoitems that they buy directly from them. Cryptoitems are stored on the blockchain, allowing players to freely trade them with each other and liquidate them. In the future, the standards around cryptoitems will make games have a decentralized yet connected economy, and possibly make them usable across game worlds. This future isn’t so far off though. We can already see glimpses of it in cryptoitem exchanges such as Rarebits and Opensea. As more and more games and items are built on blockchain the network effects will kick in, until the rolling cascade forces us to recreate our monetization models once again. Game developers, digital creators and potentially all of us will be affected by the blockchain. At Alto, we want to enable developers to navigate this disruptive transition and find success in the new decentralized world. Reach out to us on our Telegram channel, and find out more about us at alto.io.